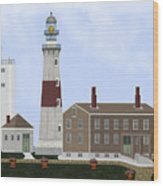 Queen duvet cover (88" x 88") featuring the image "Montauk Point Lighthouse Long Island New York" by Anne Norskog. Our soft microfiber duvet covers are hand sewn and include a hidden zipper for easy washing and assembly. Your selected image is printed on the top surface with a soft white surface underneath. All duvet covers are machine washable with cold water and a mild detergent. Such a fine primative rendering. 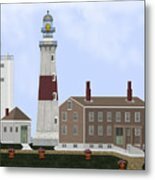 I can smell the sea and wonder what the view would be like from the top of the lighthouse. A bit on the trite side but nonetheless a fine rendering. I am just wondering if this is one painting that is created for PEOPLE or for YOURSELF?. If your realism is anything as defined as your innocent style, it will be wonderful to see more. Being a photographer, I am constantly taking photos of landmarks. I have several photos of this particular spot. SO Great Anne, your have really taken it to a higher ground in your wonderful art!! Hi James, You are entirely welcome. Painting this was my pleasure. Glad you like it. 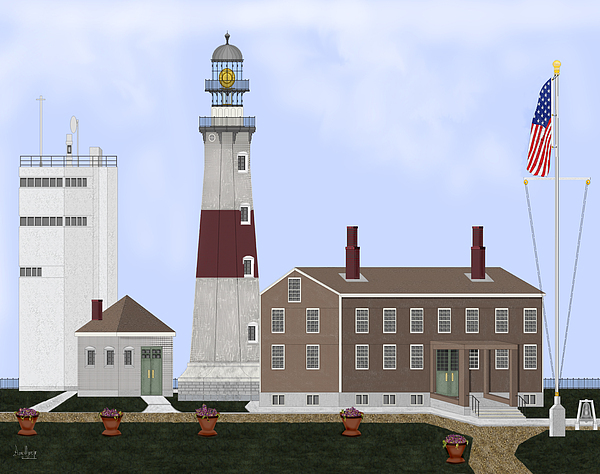 Montauk Point Lighthouse in New York was commissioned by none other than George Washington. 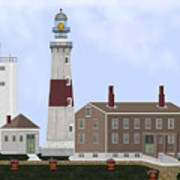 This complex sits at the eastern tip of Long Island. The GPS coordinates are: Latitude: 41.071 Longitude: -71.85706 Every piece of art in my gallery is original; not scanned; not a photograph. Using only the computer mouse, I draw every line, add every bit of shading, highlights, blending, and refining to finish a piece. All of the art is started on a blank white page in Microsoft Paintbrush. The finishing process is done using Photoshop Elements. Every piece is printed using only the finest of professional materials available, by a professional printing house. Rigorous quality control is employed to guarantee a satisfactory work of fine art. Fine canvas and museum-quality signed, numbered and authenticated paper prints are available from the gallery. Open copies are now available on FAA with POD.